Working around all the rain storms, was finally able to get all the parts that were recently prepped covered in primer … and those parts that are interior components, covered with JetFlex water reducible paint. Painted all the interior panels with JetFlex WR except for the corrugated F-1207F baggage bulkhead cover and the F-1206E baggage floor cover. These two parts were not painted because they will be cut as part of the bulkhead modification being incorporated by DOG Aviation so will spray them after cutting. An interesting situation with JetFlex. As is typical, I did not take any photos of the spray session … (like to keep the camera far away from spray painting activities) so I don’t have any photos to share, but I did have an experience I will share. While painting with the JetFlex WR paint I accidentally dragged the air hose across a wet panel and slopped up the paint. I finished painting another panel which took about a minute or two tops and grabbed the messed up panel, quickly soaked a towel in the ammonia & water cleaning solution used for cleanup and began wiping the panel down to the primer. This went well except when the paint turned into a very thin film it seemed to instantly dry in place. No amount of scrubbing with the solution would cut through the thin film so I just dried the part off and re-sprayed the panel … turned out nice. Then a few minutes later, while spraying a second coat on another part, the paper part number label was blown onto the paint by the HVLP spray gun. Oh Great! Another screw up! So I grabbed another towel, soaked it in the ammonia and water solution and began trying to wipe off the paint … but to no avail. The JetFlex would not come off with a towel to smooth out the area where the part label stuck to. Ended up using 320 grit wet-or-dry sand paper with the ammonia solution to successfully feather out the bad spot and then re-sprayed. Have to say, JetFlex keeps amazing me at how tenacious the paint is for being a water reducible paint. 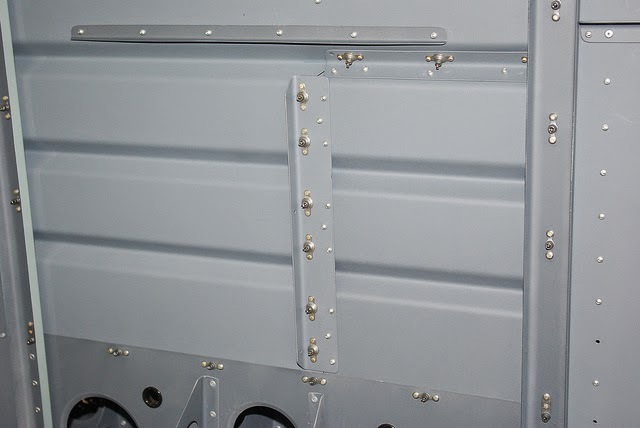 The baggage bulkhead modification: History, … builders of the RV-12 have come to realize that when the fuel tank is installed, it covers the mounting screw holes for a portion of the corrugated F-1207F baggage bulkhead cover and also the F-1206E baggage floor cover. During annual inspections, fuel tank removal is required to gain access to the screws so both panels can be removed to allow access to areas that require inspection during the annual. As such, quite a few builders have been making modifications that allow removal of the panels without the need to remove the fuel tank. 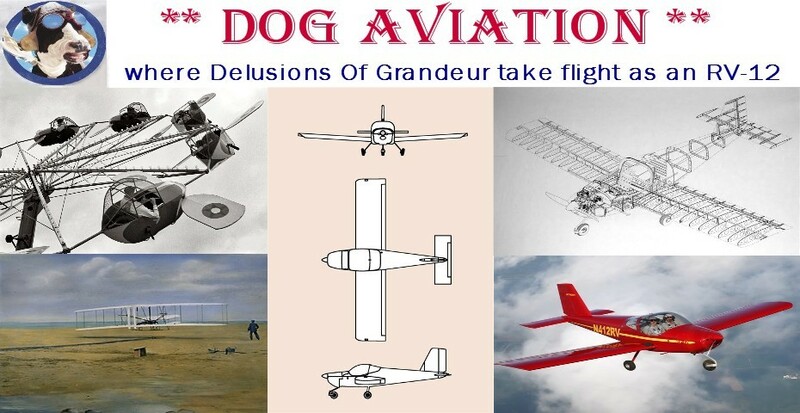 At DOG Aviation we embrace modifications that make good sense and this is one of those modifications that makes good sense to me. Because the DOG Aviation RV-12 is being built under E-AB rules, this modification will be incorporated into the build now as opposed to later. The two photos below are of another builder’s modification to show what the modification will look like when finished. RV-12 baggage bulkhead modification made by Rob from Perth Australia. The piece sitting on top of the bulkhead will be permanently covered by the fuel tank. The rest of the bulkhead cover will unscrew from the new nutplates attached to it. Back view of the aft side of Rob's baggage bulkhead showing the modifications Rob made to his RV-12 baggage bulkhead cover. There have been several methods used by builders to complete the bulkhead modification, but Rob’s modification caught my eye and sensibilities … so I contacted Rob to ask for measurements for the cuts. I did this because the fuel tank is not built yet, so did not know exactly where it will be positioned. 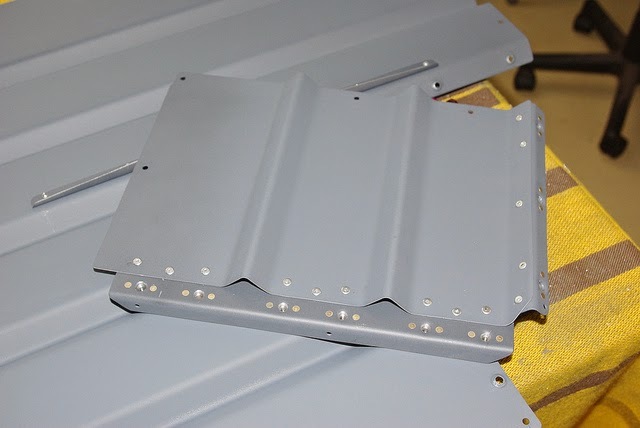 Most builders just use flat aluminum, however Rob's design uses aluminum angle to add strength to the area of the cutout and finishes off by using countersunk screws for even more strength. As it turns out, Rob is an engineer (no wonder I liked his modification method) from Perth Australia. Rob was more than happy to pass along the measurements for the cuts and as an added bonus, the dimensions for the angle doublers as well … many thanks Rob! That was an unexpected nice surprise. Today work began on making the components necessary for the baggage bulkhead modification. Sheet aluminum .040 thick was cut for the doublers, deburred and a taken to a fabrication shop to bend on a brake. About to begin cutting a long strip of aluminum from a .040 sheet which will make the three doublers for the F-1207F and F-1206E panels. Using the band saw to separate the three doubler pieces that will be made into angles on a brake. Rob used .025 aluminum to make a stiffener for above the horizontal cut in the baggage bulkhead … unfortunately, the closest size the DOG Aviation stock room had was .032 so that is what was used to make the bulkhead stiffener a little overkill here. After all the parts were cut out on the band saw, Mike came by and the two of us went over to his friend Steffon’s fabrication company to use his metal brake for bending the pieces into angles … thank you Steffon for the use of your brake to bend the parts ... could not have made them that precise or as easily at the DOG Aviation shop. The three .040 doublers and one .032 stiffener that will comprise the parts necessary to make the modification to the corrugated F-1207F baggage bulkhead and F-1206E baggage floor cover. The photos of Rob’s modification clearly show what will be done to the F-1207F bulkhead panel but do not show the modification for the F-1206E baggage floor. Basically, a piece of angle is attached onto the existing baggage floor rib to create a point to screw down the yet to be cut portion of the F-1206E baggage floor which will remain under the fuel tank. The photo below shows how the newly made angle will attach onto the existing rib and my finger is pointing to where the cut will be made in the F-1206E baggage floor … basically on the line where the angle will attach onto the existing baggage floor rib. Holding the newly made angle in position and pointing to where the F-1206E baggage floor (shown in the foreground) will be cut. Still need to drill holes and dimple where necessary plus make the cuts on the F-1207F and F-1206E panels … so there is still a few hours of work needed before the modification is completed and the cut panels can be painted with JetFlex.